If you’re the average person living in America, as I am, you probably aren’t familiar with the GAPS diet. Despite being swarmed daily with a multitude of different diets, somehow healing diets like GAPS or even the SCD (Specific-Carbohydrate Diet) do not come up in everyday conversation. You may have heard that sometimes people with severe epilepsy will try a diet approach to helping with their seizures (the ketogenic diet) or that persons with diabetes have to follow a specific diet, but in general, most people are completely unaware of healing diets like GAPS. I know that I was. This lack of common knowledge about the GAPS diet (and the entire GAPS Nutritional Program) may lead many to feel then that it must be for just a select few individuals, perhaps ones with a rare disorder; or maybe it’s just a new fad that’s starting to come out. This is far from the truth. The GAPS Diet could potentially benefit hundreds of thousands of persons on earth today, and the diet that it is based on, the equally unknown Specific Carbohydrate Diet (SCD), was the idea of an American pediatrician and researcher from the early 1900’s (much earlier than many of the diets considered “standard” today). Back in the early 20th century, medicine was different than it is today. Today, we have a different doctor to see for each part of our body, and the usual method of treatment either involves medicine or surgery. Back then, the physicians treated the whole individual, and they often used diet and natural methods of treatment. Dr. Sidney Valentine Haas, and his collegues Drs. L. Emmett Holt, Cristian Herter, and John Howland, researched the effect that diet had on celiac disease (severe gluten intolerance) and other digestive disorders. With time, though, and the discovery of a gluten free diet for celiac disease, many forgot about the SCD diet and the other digestive disorders that it could help. A very select few people have true celiac disease, and many, many more have other digestive issues or gluten intolerance; even true celiacs do not always show improvement by simply following a gluten-free diet. More healing is needed. The SCD diet was implemented by a mother named Elaine Gottschall, who through the diet recovered her daughter from severe ulcerative colitis and neurological problems. Because of her great success with the diet, she became an advocate for SCD, helping thousands of others over the years prior to her death in 2005, even writing a book entitled Breaking the Vicious Cycle: Intestinal Health Through Diet. This is the diet that the GAPS diet is largely based on. The GAPS diet was created by Dr. Natasha Campbell-McBride, a neurologist living in the UK, who through the diet recovered her child from autism. She now works at The Cambridge Nutrition Clinic, a clinic that she founded in 1998 to help other persons suffering from conditions that the GAPS diet could help. She is also involved in education, helping others to realize the benefits that this protocol can bring to them and their children. In a previous post (“The GAPS Diet – Why?”), I discussed the connection between the brain and the gut. Few people may realize that they actually have a problem with their digestive system. Persons with celiac disease or ulcerative colitis, yes, but someone with eczema? Probably not aware of the true cause. When we realize how connected our body is, and how the health of our digestive system affects the rest of us, we begin to see how the GAPS diet may begin to benefit more and more people. The purpose of the diet is to “heal and seal” the gut, meaning that toxins and undigested proteins that were previously escaping through a “leaky” gut and wreaking havoc on the body are no longer able to do so, as the gut wall has healed and is solid again, no longer letting objects that aren’t meant to get through to pass. Nutrients again are properly absorbed; the body is restored to health. Who, then, can benefit from following the GAPS Protocol? We may not know someone personally with Crohn’s or celiac disease (or if we do, maybe we know one or two), but how many of us know someone suffering from depression or who have suffered from it personally? What about kids with eczema, allergies, asthma, learning disorders? Our modern way of eating has lead many of us to develop more and more chronic illness; our kids are becoming more and more unhealthy. What is this setting up for them in the future? As adults, will they be more prone to developing more serious neurological disorders or severe digestive disease? If it’s true that “you are what you eat”, then what is our modern diet doing to our body? Our modern lifestyle is leading us in the wrong direction, toward more and more chronic illness. The sicker that our digestive system becomes, the sicker our body and our BRAIN become. A scary projection from the CDC: by 2025 (that’s just about 10 years away, people) … by 2025, 1 in 2 children will have autism. That is HALF of all children. 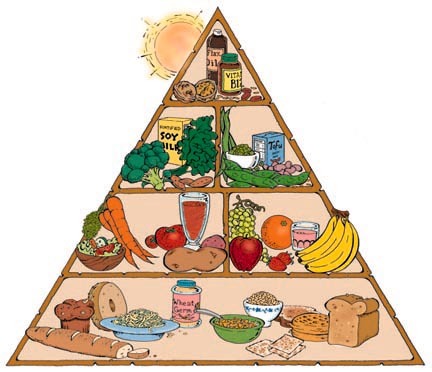 So, you can look at this food pyramid and laugh, but sooner or later, we will all have to deal with the way that modern society is harming us and our children. We may not have a lot of control over the air we breath, but we definitely have control over the food we put in our bodies and the chemicals that we bring into our homes. The GAPS diet is meant to be a program of healing that lasts approximately two years but has a lifetime of benefits. When followed properly, the GAPS diet can lead to healing and a reduction or elimination of symptoms. Best of all, the gut becomes healthier, which in turn leads to better health in the future. So, if you or your children suffer from eczema, allergies, autism or another learning disability, or digestive issues, you can either do the work now or pay later. The GAPS Nutritional Program has benefitted our family in numerous ways, and it isn’t about eating cardboard and sawdust. The food is delicious, as it’s real and full of nutrition, and when we notice our bodies becoming healthier and stronger, it’s hard to imagine another way to live.